I would say I have at least a cursory interest in every animal I’ve ever read about or seen in a documentary. Life is life. It’s all interesting. (Read Richard Dawkins’ The Ancestor Tale.) But for the past 3 years (as of this July), I’ve had a special interest in bats. You see, I deal with an invasion in my ceiling of the little things every summer. I’m not sure if it’s really beautiful or just creepy hearing them scamper about, but I do enjoy laying awake listening to them. At least, I enjoy them until they manage to get inside. At that point it’s a matter of catching them with a blanket before the cats catch them with a set of claws and teeth. It wouldn’t be so bad if 1) I didn’t have to get my indoor cats preventative shots I otherwise wouldn’t have bought and 2) there wasn’t the ongoing white nose syndrome epidemic going on with bats. The disease so far appears to be limited to bats – decimating huge colonies – but since it isn’t very well understood at all yet, I don’t like the idea of exposing my animals to it (or myself). Local and national experts, however, believe euthanizing infected bats may not prevent the spread of the disease and could be “counterproductive” to the effort. Dr. Merlin Tuttle, founder of Bat Conservation International, said white nose syndrome has reached epidemic levels, killing more than 1 million bats since 2006. He said in cases, like this one, where a disease has a very high mortality rate, it is important to see if some infected bats are able to fight off the disease. That way, those with immunities to a disease are able to pass on that ability to their offspring, eventually re-populating the species with bats that can withstand the disease. It isn’t an easy call. Bats are dying in record numbers. Something clearly must be done. Evolution may provide the doing – after all, bats have been around for 50-55 million years – but if humans can successfully intervene, then we should. The problem is that we just don’t really know how to go about it. Ken Ham, that dishonest creationist D-bag with a ‘museum’, recently held a “Date Night” where he spouted off about “love” and his own, personal ideas concerning marriage. People were allowed to buy tickets for the Christian price of about $72. And, as you do with events about “love”, Ham had security goons posted all over the place. That led to some problems. Three of us (myself, my girlfriend and our friend Brandon) passed the security checkpoint despite minor scrutiny. We arrived right at 6:00 p.m.; Ken Ham was just beginning his talk of love in the museum’s special effects room, and we were eager to hear it. Brandon’s “date,” Joe of Barefoot & Progressive, was late, and so the solo Brandon was the focus of much interest for the two guards, who carried the air of actual police. “What kind of car will she be driving?” asked one of the guards. They wanted to know so they could keep strict tabs on who came into the museum. You can guess how things went from there. The gay couple was denied entry for not being very Christian and Ham continued on about “love”. It’s weird, isn’t it? There is no way to resolve what makes one person more or less Christian than the next when both stake a claim to that awful title, yet people still seem to think otherwise. It’s a wonderful exercise is pure subjectivity. Of course, none of this may have happened if the state was different. Kentucky has no law granting equality to its gay citizens. Maine and about 20-25 others states do (depending on the exact extent of equality being discussed). So as it stands, Ham’s immorality is perfectly legal right now, even if ultimately unconstitutional. That’s terrible, but at least it will be easier for future generations to see his sort of bigotry for how absurd it really is; I predict in 35-40 years that the actions of Ham and his goons will be widely viewed much as we would view them if they did this to a black couple today. State Rep. Tom Riner, D-Louisville, a Southern Baptist minister, placed the “Almighty God” language into a homeland security bill without much notice. Riner said Wednesday that he is unhappy with the judge’s ruling. The way he wrote the law, he said, it did not mandate that Kentuckians depend on God for their safety, it simply acknowledged that government without God cannot protect its citizens. Riner doesn’t know his history too well. Jefferson would have hated this blatant attempt to join one religion over the expense of all other beliefs. He also would have rejected the very premise of stressing God’s role in securing the protection of Kentucky. The man did not believe in miracles or the general intervention of a particular, cultural god in human affairs. He was a deist who didn’t have such an incredibly small-minded notion of a creator. Attorney General Jack Conway defended the law in court, arguing that striking down such laws risked creating a secular society that is wholly separated from religion. Uh…that’s exactly what Jefferson and the other founding fathers intended the United States to be. I’m glad the court agreed. It’s long been known that creationists love to quote-mine. They’ve long done it Charles Darwin, Richard Dawkins, Stephen Gould, Albert Einstein, and plenty of other scientists in order to support their positions. No one is really all that surprised when they keep doing it again and again. So it is nonchalantly* that I present yet another example. This time it’s Creation “Museum” supporter Tom Estes. So I have been wondering; why do atheists have such animosity for Ken Ham? He is attacked so viciously, so often by atheists that I wonder if they have pure, unadulterated hatred for the man. And again I wonder, why? 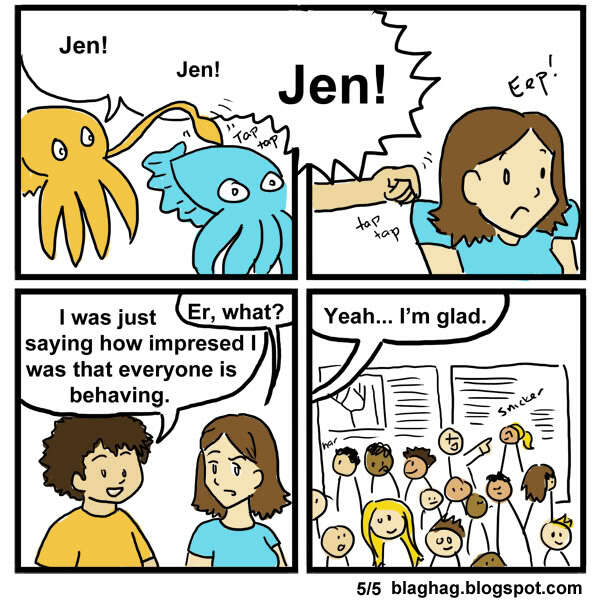 Before I go on, I want to share this cartoon that was drawn by Jennifer over at http://blaghag.blogspot.com. Okay, got it? Estes is looking to support the idea that atheists simply hate Ken Ham. The hatred is so intense it’s even unadulterated. So what’s he do? He reposts a cartoon. Here’s what he featured. 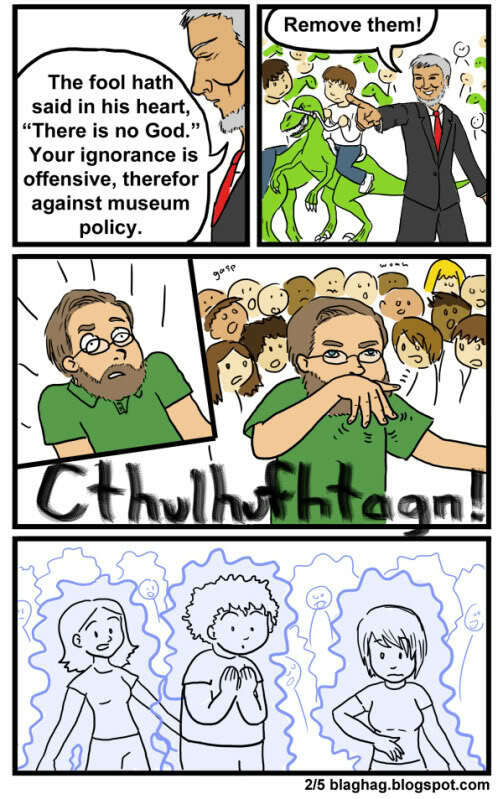 To see the rest of this cartoon, visit the Blaghag. This seems to support Estes point quite well. 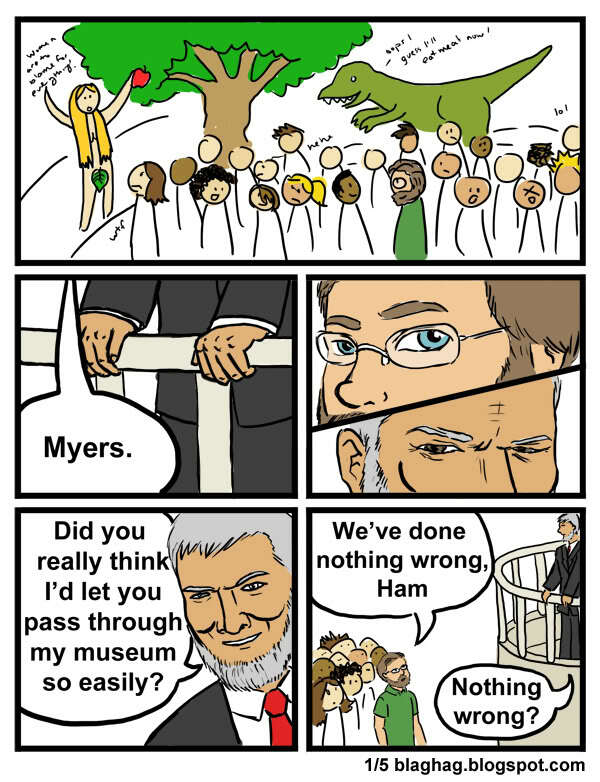 Clearly, the cartoon is indicating the pure desire of atheists to express their unadulterated hatred for Ken Ham. But wait! As it turns out, the cartoon is actually showing that, yes, atheists don’t like Ham very much. He misrepresents science as much as humanly possible. That’s a bad thing. But the point is a far cry from unadulterated hatred. 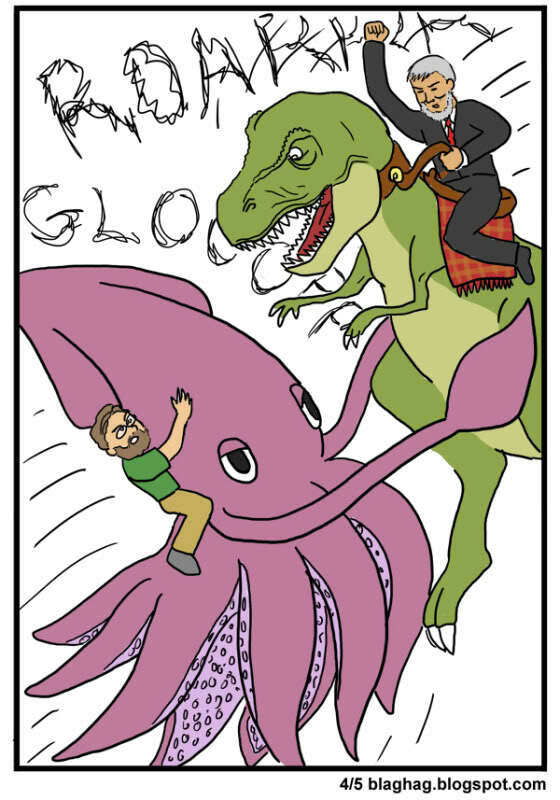 It’s a play off the whole Expelled debacle combined with PZ Myers’ love of squid and squid-like creatures and a mockery of Ken Ham’s silly beliefs about dinosaurs. It’s a bit of fun, and in the end it shows something decidedly less cool but clearly more welcomed – everyone being civil to each other. 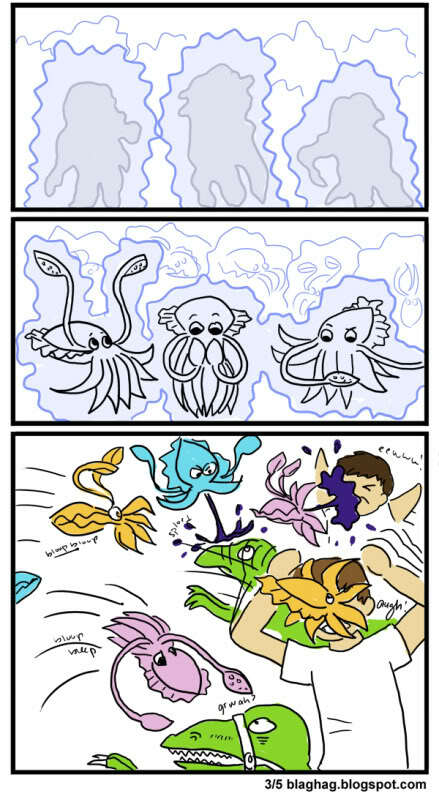 Estes chopped off this portion of the comic (adding a link back to the front page – not the original post – of the cited blog). He’s just another creationist. He’s willing to ignore what’s inconvenient to him in order to support his position. It’s sort of like the entire concept behind Ken Ham’s bad “museum”. *Doesn’t it seem like “chalant” should be a word? Instead of “So it is nonchalantly that I present…” it would be way better to say “So it is without chalant that I present…”. Just sayin’. Following up on Kentucky’s homeland defense by a god, it looks like an atheist group is suing to have the offensive (and unconstitutional) language removed. “It is one of the most egregiously and breathtakingly unconstitutional actions by a state legislature that I’ve ever seen,” said Edwin F. Kagin, national legal director of Parsippany, N.J.-based American Atheists Inc. The group claims the law violates both the state and U.S. constitutions. It’s pretty obvious this group is going to win this suit, bar some issue such as legal standing, perhaps. But Democratic state Rep. Tom Riner, a Baptist minister from Louisville, said he considers it vitally important to acknowledge God’s role in protecting Kentucky and the nation. It’s almost a non-sequitor. Of course no government can guarantee perfect security. The opposition to divine providence has nothing to do with this. No mythical creature is going to guarantee anything other than a deluded populace. Bombs will still blow things up. State Rep. David Floyd, R-Bardstown, said the preamble to the Kentucky constitution references a people “grateful to almighty God,” so he said he sees no constitutional violation in enlisting God in the state’s homeland security efforts. This is beyond stupid. David Floyd probably also sees no clouds on a rainy day. “God help us if we don’t,” he said. Two hands working do more good than a thousand hands clasped together in prayer.